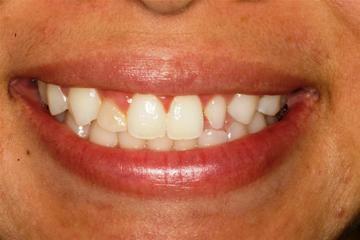 About half of all Americans are not happy with their smile, according to the American Academy of Cosmetic Dentistry. Fortunately, there are many ways to improve your smile today. Whether you are suffering from crooked teeth, gaps between your teeth, or misshapen or discolored teeth, porcelain veneers can give you an instant smile makeover. 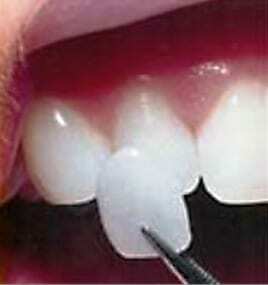 Porcelain veneers are thin wafers of porcelain that are custom designed in both shape and color. These wafers are then bonded directly to your teeth, giving you the smile you have always wanted. Porcelain is the perfect substance to use for veneers because of the way it mimics the natural translucency of your teeth. The surface is actually harder than your natural tooth enamel and more stain resistant, giving you some protection from the normal wear and tear your teeth undergo as you age. You can have a gorgeous new smile in just two appointments. Before starting, Dr. Randall Burba always carefully plans your new smile design. He will take pictures of your smile and discuss the kind of smile design you’re looking for. From there he will create a mock-up of your smile and make sure it meets your expectations. When you sit down in the dental chair to have your smile makeover, he will start by doing any tooth preparation that may be necessary. Some slight shaving of your teeth may be required, and then impressions will be taken to send to the ceramist who will actually make the veneers. Dr. Burba will then make you a set of temporary veneers in order to “test drive” your new look. At your second appointment, he will try in the new veneers, make sure you love them, and then permanently apply the actual veneers. It is that simple. We are so certain you will be thrilled with your new smile, we guarantee it. Click here to learn about our beautiful smile guarantee. Below is just one example of the kind of results you can get with Dr. Burba. 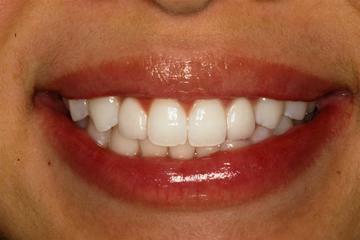 On the left is her smile before porcelain veneers. On the right you see the after photograph. Who Should Place Your Porcelain Veneers? It is very important you choose an experienced, artistic cosmetic dentist to place your porcelain veneers. Dentists, as a rule, tend to be engineering-oriented. They chose dentistry because they like to fix things, and some aren’t very artistic. Dr. Randall Burba, however, is passionate about appearance-related dentistry. Furthermore, he has taken great pains to obtain extra training in cosmetic dentistry and has passed the rigorous accreditation examinations of the American Academy of Cosmetic Dentistry. There are only a handful of dentists in the entire New England area that are AACD accredited. If you’d like to know if you are a candidate for porcelain veneers, you may schedule a complimentary consultation by clicking here to visit our request an appointment page or calling our office.